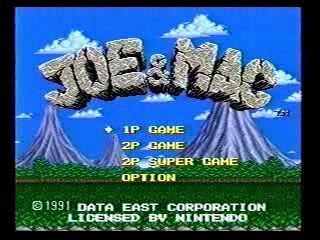 Joe & Mac is an arcade platforming game released in 1991. It stars the green-haired Joe and the blue-haired Mac, cavemen who battle through numerous prehistoric levels, using weapons such as bones, boomerangs, fire, and even stone wheels. The objective of the game is simply rescuing a group of girls who were kidnapped by a rival gang of cavemen. The SNES port features an overworld map which lets players choose levels, which are longer than the arcade version, plus some bonus stages (either in the levels or out in the world map). Some of the weapons are missing and can no longer be charged up. The most unique item in this game over the other Joe & Mac games is the addition of keys. Also, the final boss is different and there is only one ending. Best time with deaths, SNES version: easy difficulty 0:23:26 by Rob 'Mickey_Mage' Whitener on 2008-09-05. This is definitely a game people should pick up on the Wii Virtual Console. It may not be the longest platformer in the world, but difficulty does play a little role in that. The reason this run is done on easy is because bosses have less health (much less in some cases), so there's really no reason to do the other difficulties, other than I guess to challenge yourself. There are 4 different throwing weapons in this game (you can use your club, but there's no point, as you need to be right next to the enemy to even hit it...), which include bones, boomerangs, fire (I guess it's a club on fire? ), and stone wheels (didn't see that coming, did you, hahaha). The strongest of the 4 is actually the fire but, you can only throw one of them at a time. The wheel is the second strongest, but the most useful in the run because there are two of them, so missing an enemy with one isn't horrible (if you miss with both, the rolling time takes longer than missing with one fire, so that's something to avoid as much as possible). To switch items, you hit Select. Funny thing, I didn't even know you could change your weapons until about a month ago or so (that's what I get for losing my instruction booklet, I guess). Running is very interesting in this game. To run to the right, you hold down the right trigger button. To run left, you hold the left trigger. In most cases, you want to only hold the right, but you can hold both of them at the same time, so you can run back and forth quickly (helpful against some bosses). Rolling is achieved by quickly tapping the left or right direction buttons twice, and then holding to keep rolling for a distance. It's probably about as fast as running, but not as effective, as you have to stop rolling after awhile, and then start again. You can run into, and hurt enemies by rolling into them, but there aren't very many instances in my run where it would have been helpful, at least to help in the long run. Level 1: This level went as well as usual. I got hurt on accident once, but the other time actually helped me, as I didn't actually have to hurt the guy to get around him. Besides, I recover the energy lost in the next level. I know there is a fire club here, but it takes too long to set up a jump to get up to it. The yellowish-orange T-Rex fight is always easy, but the movements aren't always the same. Thankfully, the T-Rex ended up on the left side of the screen when I killed him. This way, the death animation took less time. Level 2: One of the easiest levels, mainly for the lack of enemies; more holes, though, so falling down one would have meant the end of the run (doesn't happen very often, though). It's a 50/50 chance I get hit by the Plant boss at the very beginning, since I can never really figure out exactly when to throw the fire to hurt him the first time. The reason I use the fire, though slower, is it's much easier as close as I am to this boss (plus, it's twice as strong as the boomerangs). This is the most efficient place to be to fight this boss, too, not just the safest. Level 3: This is one of 3 very short levels in this game, and the boss is also fairly easy, too. It's also pretty much impossible to not get hit here at least once. As most bosses in this game, the attack patterns of the Pterodactyl are random, and so getting hit at the end before killing him was not expected. Level 4: Annoying, flying Piranha fish pretty much sums up this level. The dolphin fight went well, I thought, though with not killing a few of them immediately when they jump out (the wheels do kill them first hit), a few seconds can be shaved off here. Also, I was very lucky I got the stone wheels to begin with in this level, as they are very rare to come out of that egg in the very beginning of the level. I don't mind having to use fire against the dolphins, but the fight is a lot smoother with wheels. Level 5: It's another short level, but done kind of similarly to Battletoads. Killing this boss fast is essential as to whether I keep going or not in the run; because a lot of time is lost if you I kill him in the initial stage of the fight. Level 6: Don't you all just love ice levels? Not the easiest level to avoid getting hurt in, but overall not done badly. I don't normally get Mastodon fights this quick, so I'm very happy about this fight. Level 7: I know, I died here... The good thing is you can recover from death fairly quickly, by tapping B until you drop down. Also, it's a good thing I died as the boss was going back up, as I couldn't have gotten very many more hits on him anyway. So, really I only lost about 3 or 4 seconds overall in this fight, as the rest was very good. Level 8: The end of this level is rarely nice to me (I almost always get hit by those falling dinosaurs) but, the rest of the level went very well, especially the Grey T-Rex fight (minus the little mistake of losing both of my wheels during this fight, which cost a second or so). But I quickly recovered and took him down. Level 10: Probably could have done a few jumps better overall, but at least the bone T-Rex cooperated with me, and I hit and killed him quickly. Level 11: This level is so annoying. Going over the lava pit is especially not fun, as the next pterodactyl doesn't come by 100% of the time, so I do what I can, and get hit as little as possible by the lava. I obviously didn't need to kill the dinosaur in the beginning to get the meat from him, so don't ask (just one of those moments, I guess). There really isn't enough meat here to help with the boss fight, so death is hard to avoid. The boss here is not as easy as you might think. When he moves his head down or diagonally, it's done usually too quickly to dodge, and you can't tell if he's going to shoot out a rock or caveman from his mouth as he moves like this either. I was also very lucky I didn't die until the last bar of health. I have survived this fight without dying once, but only once... Over all the complaining, though, this part of the level was actually good, and hardly that much time was lost, at least to affect the time overall. Level 11 (part 2): Inside the beast we go. This guy really should go on a better diet, with all that's inside and all, haha. Yay, we get to fight the devil now, and guess what, there are two colors; red and blue. I like the touch of adding dead plant things to fight before the devils, too; kind of like gall stones, I guess... Thankfully, the red devil is not that difficult, and a lot of his attacks are easily avoidable, which is good since if I get hit by him too much, it's much harder to survive the fight against the blue devil. Even then, killing each of them fast depends solely on their attacks, and where they move to. I had one mistakes fighting the blue one, by accidentally throwing both of my wheels, and missing. The rest of the fight against the blue one was very good, though, despite how random his teleportation is. Very good run overall, and I'm very glad I achieved my time of sub-24 minute. As random as this game is, getting the time I did is incredible. Overall time lost I seriously doubt is over 26 seconds, but a perfect time would come very close to getting under 23 minutes.